Jimmy Jangles presents: The Optimus Prime Experiment: What songs has Bono written about Africa? What songs has Bono written about Africa? What songs have U2 and Bono written about Africa? 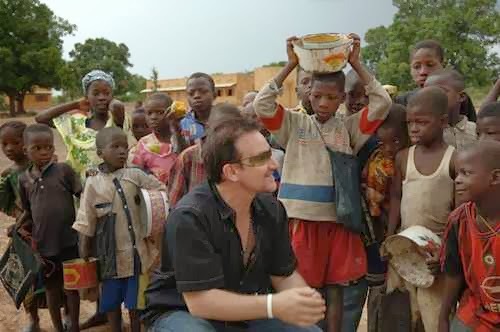 Bono has sung many political songs over the years and many of them focus on the struggles of people within certain countries, here's a few songs related to Africa. A non album track by U2, it was used to promote the film which tells the story of Nelson Mandela's A Long Walk to Freedom. An anti-apartheid song written with guitarist Little Steven to protest the oppression of the South African people by the regime that existed at the time. Bono did a cover of this song with Alicia Keys. It was originally recorded by Peter Gabriel and Kate Bush. A song inspired by Bono's work in Africa in the early 80s. The song's lyrics are a juxtaposition of the U2's early live in Belfast, Ireland where one could tell another's religion by the area in which they lived. The lyrics of this song are a commentary about the relationship between Western countries and developing countries such as Africa. The verses and chorus address the relationship from the perspective of citizens from the developing world, focusing on the disparity between the long-term socioeconomic planning stressed by the West and the developing world's immediate need for sustenance. How many number one songs have U2 had?